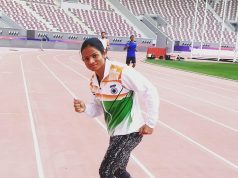 By Avilash Panigrhi, Bhubaneswar: Odia Hockey Star Sunita Lakra led Indian Women’s Hockey Team will hope to start their Asian Champions Trophy campaign on a positive note. The defending champions to open their campaign against a tough Japanese side at the 5th Women’s Asian Champions Trophy here on 13 May Sunday at the Donghae City in Korea. Besides India and hosts South Korea, Japan, China and Malaysia will vie for top honours. Indian team must be expecting to ride on the good show at the recently-concluded Gold Coast Commonwealth Games, where it entered the semi-finals after 12 years, eventually finishing fourth. In 2016, the women in blue had defeated China in the final to win the previous edition of Asian Champions Trophy. The team followed up this victory with a successful outing at the 2017 Asia Cup where they beat China again in the summit clash to clinch the trophy. “We are Working hard in terms of goal conversion and improving our attack “ said the newly appointed captain before leaving to Korea. Sunita will expect her team to get their act together and aim for consistency in this tournament as several big games like Hockey World cup and Asian Games have been lined up for them. 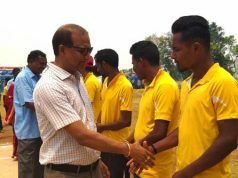 Apart from Sunita Lakra, four other players from Odisha namely Deep Grace Ekka, Namita Toppo, Lilima Minz and Anupa Barla have found place in the team to defend the title. Experienced Deepika, Deep Grace Ekka, Suman Devi Thoudam and Gurjit Kaur, who doubles up as a drag-flicker, will man the defensive line while the midfield will feature Monika, Namita Toppo, Nikki Pradhan, Neha Goyal, Lilima Minz, Navjot Kaur and Udita. India’s forwardline will be led by Vandana Katariya, Lalremsiami, Navneet Kaur and Anupa Barla. Interestingly, it is expected to be Dutchman Sjoerd Marijne’s first assignment with the team following his return to the women’s camp after being in charge of the senior men’s side for eight months. The team will be missing the experience of Captain Rani, forward Poonam Rani and defender Sushila Chanu who have been rested but the hockey fans are expecting this won’t deter the team’s target of defending the title. Former Indian Captain and Olympian Padmashree Dilip Tirkey have extended his wishes to the Indian women’s Hockey team and stated Sunita Lakra led Indian team will definitely defend the trophy. Wishing @TheHockeyIndia women's team all the best for upcoming Asian Champions Trophy. I believe Sunita Lakra led #TeamIndia will definetly defend the title . Defenders: Deepika, Sunita Lakra (C), Deep Grace Ekka, Gurjit Kaur, Suman Devi Thoudam. Midfielders: Monika, Namita Toppo, Nikki Pradhan, Neha Goyal, Lilima Minz, Navjot Kaur, Udita.